Abstract: The Antec TruePower 330's electrical characteristics when hooked up to a system were excellent, and voltages remained very stable. If you were to ask in the PCstats forums about which companies produce the absolute best computer power supplies; PC Power & Cooling, Seasonic, Vantec and Antec would surely be among the top five. Antec is so popular that there are literally legions of enthusiasts who swear by them, and exclusively use Antec PSUs in their systems! Antec's bread and butter is their uniquely designed, and well built computer cases. They've successful spawned countless knock offs, though only the Antec versions come with Antec power supplies. In the late 90's I can remember hearing about some dedicated enthusiasts who would specifically buy Antec cases just for the power supply, since Antec PSUs were difficult to find separately back then. Of course Antec must have noticed this, and now its power supply line is now at the forefront. Today we're going to be checking out a budget-oriented Antec power supply called the TruePower 330W PSU. It's doesn't have flashy lights, LED fans or other gimmicky items. With a retail price of $73 CDN ($57 US) the Antec TruePower is not the cheapest 330W PSU around, but it should be among the best you can get in its class. 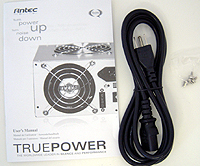 The Antec TruePower 330W comes with some case screws, installation manual, plug and three year warranty. 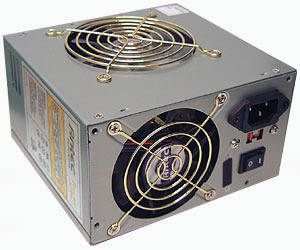 The unit is compatible with 115V/230V mains supplies care of a voltage selector switch, and is ATX12V compatible. For power connectors there is a 20-pin and 4-pin auxiliary connector, as well as the little used 6-pin inline power connector. With respect to peripheral connections, the Antec TruePower 330W features seven Molex, two Serial ATA, two floppy and two 12V fan-only power connectors. All the connectors are black, and the main ATX power cable is wrapped in a cable sleeve to keep it neat. Since I use a full tower Lian Li case, I like to see power supplies with cables long enough to reach all the devices in the case. 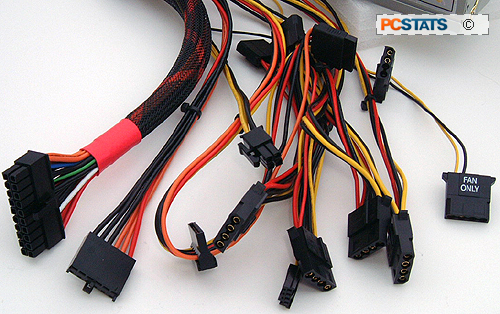 The main 20 pin ATX power connector and ATX12V lines are all 55cm in length, as are the molex/Serial ATA power cables. I don't think I've ever seen external devices which use a molex power connector, but should you have a pump, or light, or TEC you want to power externally, the Antec TruePower 330W has a one hidden away on the back of the unit, right next to the power switch. A nice feature for those who might use it!